AP EAMCET 2018 (హయ్యర్ ఎడ్యుకేషన్ ఇంజనీరింగ్ వ్యవసాయ మరియు మెడికల్ కామన్ ఎంటన్స్ టెస్ట్ ఆంధ్ర ప్రదేశ్ రాష్ట్రం కౌన్సిల్): Andhra Pradesh State Council of Higher Education will conduct Engineering Agriculture and Medical Common Entrance Test in April. Interested and eligible applicants who wish to get admission in the engineering courses can apply for the AP EAMCET Application Form 2018. The dates are not declared yet but the students have to submit the form before the deadline of the form. The students will be selected on the basis of the marks obtained by them in the entrance exam. The Notification is still not published. Only Eligible applicants will be able to apply online for the AP EAMCET Entrance Test. All the necessary details about the AP EAMCET Engineering Entrance Exam 2018 are prescribed below in a procedural format. The students who are willing to get admissions in various engineering, medical and engineering courses in the state of Andra Pradesh. They can apply online for the AP EAMCET Registration 2018. The students have to perform the process before the due date. The aspirants who will fail to do so will not be permitted to appear in the exam. The application form will be released in the month of February. And they can be submitted on the official website only. The aspirants have to pay the application fee by any of the online banking modes. Steps to submit AP EAMCET Application Form 2018. Candidates who applying for entrance examination they have to register them self on the website of Andhra Pradesh EAMCET 2018. Fill the Entrance test Application form. After that applicant has to submit the application form to AP EAMCET. Take a print out of the application form for Other uses. An interested and eligible applicant who applying for the entrance examination for B.Tech programs, first they have to meet the eligibility criteria to apply online for the application form. Following are the eligibility criteria of the Andhra Pradesh EAMCET given as follow. The candidate is required to belong to the AP or they should satisfy the local or the nonlocal status as per the rules of the AP Education Institutions order 1974. Applicant should pass their 10+2 from the recognized education board. With the minimum, marks are 45% for nonreserved category and 40% required for the reserved category candidates. Candidate should pass their 10+2 from Mathematics and Physics as main subjects along with Bio-Technology or Chemistry or Biology which is an optional subject. 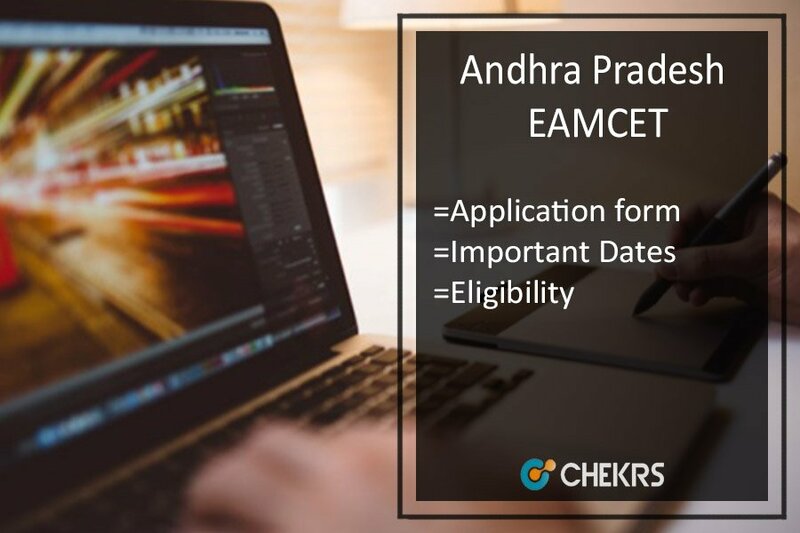 Here are some Important dates of the Andhra Pradesh EAMCET 2018 Candidate can refer this date. Following are the AP EAMCET Important dates. The Andhra Pradesh EAMCET will conduct the examination in the following examination centers which is given down. After getting the examination syllabus applicant can start the study. The examination syllabus will also be going to help the candidate to score good marks in the entrance examination. Following are the AP EAMCET Exam syllabus 2018. Candidate will know about the subjects wattage of the AP EAMCET. Through this applicant can score high marks in the entrance examination. This will also help them to understand the difficulty level of the exam. The exam will be conducted in the month of April. So students have to check it as soon as they can. Here is the Andhra Pradesh EAMCET Exam Pattern 2018 given below. The students who have submitted the application form successfully and now waiting for the admit card. They can download the AP EAMCET Admit Card 2018 soon. The authorities will release the admit card on the official website. The aspirants must note that it is an important document. The students have to bring their photo id along with the admit card on the day of the exam. No students will be allowed to enter the examination center without their admit card. With the help of admit card applicant will know about Examination center and date of examination. The aspirants who have participated in the entrance exam successfully and waiting for the results. They can check the AP EAMCET Result 2018 in the month of May. Tha authorities will release the results on the official website. The selected students will be listed in the merit list. Then they will be called for further processes. The students have to clear the cut off marks for appearing in the counseling process. Andhra Pradesh Engineering, Agriculture and Medical Common Entrance Test is conducted Jawaharlal Nehru Technological University, Kakinada. Applicants who want to pursue the Engineering course for this University than they have to qualify the exam. After that, they will be called for the AP EAMCET Counselling Process 2018. The process will starts in the month June. The students will be allotted seats according to their name in the merit list. The seat allotment will be done on the basis of marks obtained by the candidates. For feedback and more queries regarding AP EAMCET 2018 Exam, you can contact us by commenting in the comment section given below.